Welcome to another instalment of the A2B Software Showcase. The Free Software Showcase is one of our regular features in which we take a look at some of the best free accessibility software available. As well as the traditional installable computer software there is now the incorporation of plugins to web browsers. Plugins are small additions to web browsers that allow additional functions when browsing the web . One of the most popular web browsers, Google Chrome, has a huge array of plugins which cover a wide range of needs. Today we are going to look at the plugin BeeLine Reader (also available on the Firefox web browser). The plugin’s main function is to assist in the easy reading of content. Reading a lengthy post can be a difficult task and it is easy to get lost if your concentration slips or you get distracted. This often leads to people starting over on the paragraph, which wastes time. BeeLine Reader helps to solve this issue by giving you the text in different colour gradients throughout. It is argued that these different colours make it easy to track your lines while reading as opposed the one colour text, where your only option would be to follow through with your finger if you were experiencing difficulty with line by line reading. 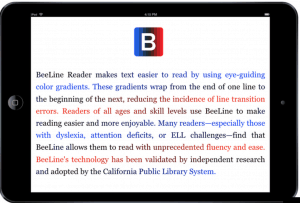 The BeeLine reader notably increases your productivity, especially for students who need to read a lot of information from different lengthy sources. With the BeeLine Reader, errors in reading and skipping lines by mistake are greatly reduced thereby making the research more efficient. Your reading speed is also greatly improved since you are able to easily follow through. Additionally, this plug-in is useful for the employed population or anyone who just wants to read content online more efficiently. BeeLine Reader has also shown beneficial results for people with specific learning difficulties. People with Attention Deficit Disorder (ADD), which is characterised by difficulty in maintaining focus for prolonged periods of time, find it easier to concentrate on reading using BeeLine Reader. It is also helpful for people who have dyslexia among other reading issues. The plugin’s success led to its awarding of first place in an entrepreneurship competition at the University of Stanford. Plugin installation is however, different from the installation of normal software. The process is easier and shorter. If you opt to get it from the parent site, just click on the the links above and you will get an ‘install plugin’ button for BeeLine reader. Click on it and you will be taken to another window of where to install it, either in chrome or Firefox. Click on the chrome option and there will be a pop-up dialogue box. From that box just click add and the plugin will be added to your chrome browser. You can now access it from the top right of your browser. When it comes to the usage part, just open whatever content you want to read online then click on the BeeLine Reader and it will provide the text in colour. If you experience any difficulties with reading, then give BeeLine Reader a try.